Professor Ahmed Kovacevic, Howden Chair in Engineering Design and Compressor Technology, spoke to over 300 delegates at the 8th International Conference on Compressors and Refrigeration (ICCR2017). Professor Ahmed Kovacevic, Howden Chair in Engineering Design and Compressor Technology, delivered the keynote address titled, “Modelling of Multiphase Twin Screw Machines”, to over 300 delegates gathered at the 8th International Conference on Compressors and Refrigeration (ICCR2017). 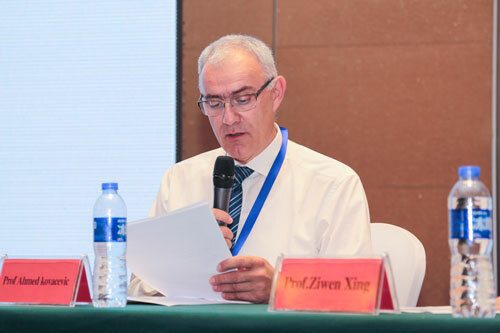 The conference was organised by Xi'an Jiaotong University and the Chinese Association of Refrigeration (CAR). The conference, held from 20th to 22nd July 2017, took place in Xi’an, the ancient capital of the Shaanxi region, home of the Terra Cotta Warriors Museum. 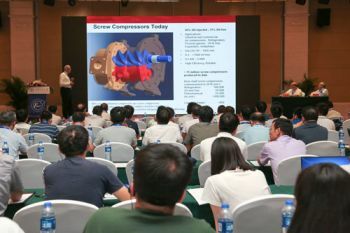 The 8th ICCR is the largest Chinese Conference on Compressors and Refrigeration. It was co-sponsored by various Chinese and international refrigeration associations and ten manufacturers of compressors and refrigeration systems. In his keynote, Professor Kovacevic mentioned the International Energy Association’s estimate that more than 17% of electrical energy produced in developed countries is consumed by compressors. Consumption increases in summer months due to ever growing demand for refrigeration and air-conditioning in developed and developing countries. In the USA for instance, this percentage increases to 25% in the summer months. It is estimated, too, that 80% of all new industrial compressors are of the screw type and that the number of screw compressors produced is close to 800,000 units per annum. Due to growing demand, it has been calculated that the global annual sales of screw compressors in 2021 will reach $11bn - growing at the rate of 6.62 percent from the current value of nearly $8bn in 2016. It is also expected that the highest growth area will be the Asia-pacific region at a compound annual growth rate (CAGR) of 8.05%. About 83% of screw compressors are produced with oil injection into the compressor chamber which requires that a significant proportion of the energy consumed by a compressor is used for transport of the oil in the system and it’s separation from the fluid after compression. Apart from polluting the environment and limiting the use of oil injected compressors for applications which require clean air, reduction of oil content in the system reduces both investment costs and operational costs - in the end reducing energy consumption and carbon footprint. Use of Computational Fluid Dynamics (CFD) is the most promising technique to allow further improvements in oil injection systems of screw compressors and operation of other multiphase machines such as expanders and pumps. CFD is still rarely used because current numerical grid generators are limited in representing complex moving flow domains in screw machines. Professor Kovacevic proposes that the unique software SCORGTM suite developed by his team at City’s Centre for Compressor Technology, allows the full utilisation of CFD’s potential solvers such as Ansys CFX, Star-CCM+, Pumplinx or Fluent. 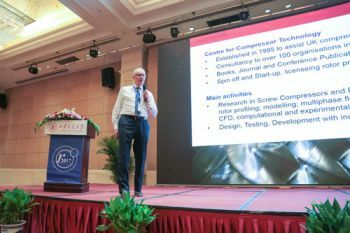 The organisers of the Xi’an conference have been collaborating with the Centre for Compressor Technology where Professor Kovacevic pioneered methods for 3D CFD (Computational Fluid Dynamics) modelling and design of screw compressors. Over the last 22 years, many researchers from Xi’an Jiaotong University have been involved in research at City’s Centre for Compressor Technology as visiting scholars or PhD students who later become leaders in their own institution. “It was great pleasure to accept the invitation from the organisers of this major conference on compressors and refrigeration and to present our research and achievements regarding the modelling of multiphase flows before a large number of industrial and academic representatives. The interest and feedback was overwhelming. This was my second time of presenting a keynote at this conference; my first time being 2015. Engineers must be at the forefront of developing technologies which reduce energy consumption and protect the environment. There has been steady interest and indeed ability from industry to apply methods from CFD modelling if multiphase screw machines and I am expecting to see new efficient and environmentally friendlier oil injection screw machines in the the very near future. City's Centre for Compressor Technology will host the 10th biennial International Conference on Compressors and their Systems from 9th to 13th September 2017. The International Energy Agency (IEA) was founded in 1973-74 during an oil crisis in order to help ensure energy security for member nations. The agency's primary mandate is to focus on the policies regarding the "three Es": energy security, economic development and environmental protection.